I love eating satay, but it is so much work to make from scratch. I have tried using different paste, but with so many preservatives included, I try not to use it too much. 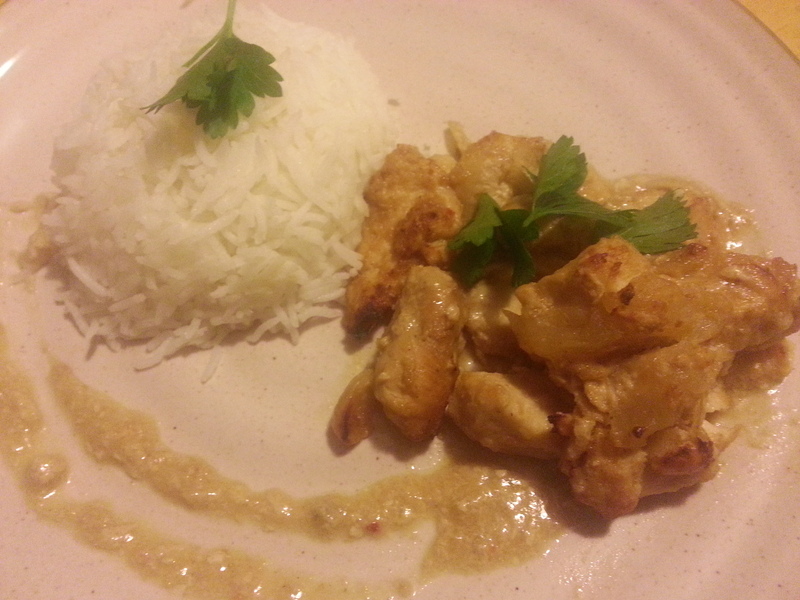 I was really pleased with my slow cooker version of Satay last night. There are quite a few ingredients that I put it, but because I was using the slow cooker, I could actually just take stuff out of my freezer * and toss them into the cooker without actually slicing or dicing. However, this just makes it a little easier. I served my satay with coconut rice. For the coconut rice, I just substituted ½ cup of light coconut milk for ½ cup of water that would be used to cook the rice. You can also add 2 pandan /screwpine leaves into your rice cooker/pot, for added fragrance. 1.4 kg chicken breast (diced) I used partially frozen chicken. 1. Into the slow cooker, toss in all the ingredients except peanuts and cilantro. Mix the ingredients together to coat the chicken. 2. Follow the settings in your slow cooker to cook the chicken. I cooked mine on high for 4 hours, just because, I wanted it done before I went to sleep. 3. When the chicken is cooked, move all the chicken into a container, but not the broth. 4. Pour the broth into a pan (use a medium heat setting). 5. Add the cornstarch and cold water mixture into the broth and mix well to incorporate. 6. Add peanuts and keep mixing until the broth becomes thicker. 7. Pour over the chicken mixture. Garnish with cilantro. When heating up my chicken, instead of using the microwave, I placed the portion we were going to eat, in a cast iron pan and put it in the oven under broil. This just gave the chicken a slightly charred taste to resemble grilled satay a little more.